Later this month, Barrett-Jackson will hold a Collector Car “event” in Orange County. If you have only ever seen their auctions on TV, you can be forgiven for assuming that the cars presented are only for retired Texas oil patch people and transplanted Hollywood production dudes. We went snooping in the Orange County catalog and found a number of notable cars that won’t go for hundreds of thousands of dollars. Ordinary people like you and I could easily participate in one of these auctions and might even come home with a bargain. For example, Lot 45.6 is a 1966 Mustang convertible, with a 289 and 4-speed transmission. The car has a new top, top boot, center console and tires on GT rims. According to the owner, the chrome and trim are in outstanding condition and the car has had one high quality repaint in 2005. That paint, however, is Sahara Beige and the interior is Tan, which makes for a quite soft-spoken appearance. This is very likely an excellent “runner” – a car that you can buy and enjoy driving to shows, events and perhaps even on vacation. You’re not going to worry about a stone chip here or there and it will never see the inside of a show trailer. Unless the Orange County location has an undue impact on general pricing, expect this car to go out somewhere in the $14K to $18K range. Another find is Lot 105, a 1965 Ford Ranchero pickup. These were Falcons that had the rear sheet metal changed over into a pickup bed, leaving only two seats up front. With a 200-cid, inline 6-cylinder engine, this particular example isn’t going to be pulling out any stumps. However, the driveline has been rebuilt and the car sports a number of custom touches, including a leather interior and 14″ Centerline wheels. Were this example more original, it might have potential as a representative example of the early Rancheros. The understated paint will fail to excite a casual buyer, while the inline-6 engine will keep the performance enthusiasts moving on by. I’ll go out on a bit of a limb here and suggest that a five-figure final bid for this one is possible… barely. For the right person with a sense of adventure, this Ranchero could be a dream car and a bargain, all together in one set of wheels. Another classic that will go home with a new owner, is a 1965 Mustang convertible with a 225-hp, A-code 289 V8 engine and 4-speed manual transmission. Lot 34 is a classic red on black convertible that draws eyes from a mile away. While the paint was redone on 2009, the interior is said to be original. While the sheet metal is original, the chrome, trim, moldings and tires were replaced after the painting was finished. This would be a fun car as a driver and for regional shows. Sure to be well considered in any participant-voting exercise, this classic Mustang is likely to hold up well. Someone attending the Orange Country event is likely to pick up this Mustang in the low $20K range. Sure, this show is also going to see its share of fifty and sixty and hundred thousand dollar plus cars, but there are some good deals and perhaps even a few bargains to be found. You won’t know unless you try. Is there an interesting car on the planet that doesn’t have a K&N filter somewhere on it? If there is, we haven’t found it yet. Pro drifter Vaughn Gittin Jr. relies on K&N air and oil filters to keep his supercharged 2011 Mustang GT running clean in Formula D drift competition. We found a cool little video of Vaughn at the Long Beach GP street course on K&N’s website, giving his thoughts on how he’s turned almost a decade of hard work into a job where he gets paid to throw his car sideways and turn piles of Falken tires into dust and smoke. A good gig if you can get it, for sure! The Forge Invitational Musclecar Classic will have a special display of Ford muscle cars at the Bristol NHRA race this upcoming June 18-20. Brandon Cross, speedway representative, turned to Tim Lopata president of the Forge Invitational Musclecar Classic to put together a collection of 60’s, 70’s and some modern muscle for this special gathering. Also in attendance will be the “Mustang Ministries.” Pastor Jamie Estes and associates, all Mustang enthusiasts, will have a display set up to talk to owners and attendees and sign up interested people for their group and forums (we’re not joking. See the image below). It’s natural to be skeptical when a company claims increased horsepower, lower emissions and improved fuel economy by simply bolting on their product. So when E3 Spark Plugs announced that their innovative plugs did exactly that, Stacy David at Speed TV’s “Gearz” went to put them to the test. Traveling out to the Michigan Technical University where E3 conducts all of its research and development in partnership with the school’s professors, engineers and product testing facilities, David got to see first-hand how the E3 plug was created. Michigan Technical University, a nationally acclaimed automotive research facility, has been at the forefront of addressing key economy and environmental automotive issues and averages over 60 million dollars in research annually. E3’s unique “DiamondFIRE” electrode provides a significantly hotter and longer-lasting spark or “flame kernel,” which produces a faster rate of burn and more complete combustion of the fuel. What does that mean? Less emissions, more efficiency, and – most importantly – added horsepower! By increasing the spark’s “early burn” and allowing the combustion to increase more rapidly, a greater percentage of fuel is spent, and the more complete the burn, the greater the power that is present in the chamber. So, does E3 claims add up? Well, according to this video, Stacy at Speed TV sure thinks so. The new 2011 model V6 Ford Mustang has made a lot of noise, both literally and figuratively – more so than any of the more economical V6 pony cars in history. With it’s 3.7-liter version of the all aluminum 60-degree Duratec V6 pumping out a stout 305 horses and a new six-speed manual transmission, the GT’s little sister isn’t so little anymore. And she’s got a great new upgraded, more intimidating look for 2011 to go along with the performance. The question on the minds of many thus far has been…how does it stack up against some of the former GT’s? The 2010 GT produced 325 horses; a scant 20 horses more than the new V6. The V6 is a legitimate contender to it, and at a lower price. So the only way to really find out is to line ‘em and let ‘em rip. Bird-Kultgen Ford, a dealership in Waco, TX, took it upon themselves to match the two cars head-to-head to answer that question. And why not? The outcome could result in some potential sales. In the first race, the GT pulled the V6 hard out of the gate, but the six-speed showed its muscle and pulled to within a car length of the mighty V8. In the second of two races, it was much of the same although the V6 did tighten the gap ever-so slightly. Clearly the GT is still faster, as expected, but never before has the little V6 been able to tail the V8 so closely. And at a savings of $4,700 and the benefit of an extra 8 miles per gallon, it’s not one to casually stroll past on the dealer lot. But hey, we’re car guys and that throaty V8 sure gets our blood pumping. The sport of drifting may have been invented in Japan, but Americans have taken to the sport like a fish to water. Aside from our love of all things tire burning, big American muscle cars may excellent drifting candidates thanks to their rear-wheel drive layout and lots of low-end torque. There are several Ford Mustangs entered in the 2010 Formula Drift championship, including a 2011 model driven by drifter Vaughn Gittin Jr. This YouTube video, posted by Roush Performance isn’t about Vaughn Gittin Jr. though. Instead, the star if this video is a 2010 Roush 427R Mustang, driven by another drifter, Ali Aljibouri. The video, which clocks in for just about 46 seconds, is a rather intense 46 seconds of non-stop drifting. Ali, who bills himself as a professional stunt driver, drifter, and test driver on his website, shows some rather impressive skill behind the wheel of this particular Roush. The smoke show never stops during the length of the video. Ali, who test drives for Cooper Tires, was apparently shredding some new Cooper RS3 rubber during this trial. This isn’t even a 2011 Roush 427R. Rather, this car makes due with last year’s technology, including starting with the base 4.6 liter V8 engine rather than the new-for-2011 5.0 V8. But with a RoushCharger, suspension and exhaust upgrades, and a skilled driver behind the wheel, you’d never know the difference. Still, we think it is about time that Roush dips its toes into the world of drifting. Who doesn’t like a sweet deal on some new parts for their favorite car, the Mustang? We’ll we know we do! Through our normal surfing, we were checking out New Take Off’s web site and found two things to improve the exterior look and function on the S197 Mustang – a Chin Spoiler and a set of Bullitt Wheels. You can find these deals as well as others from New Take Off, by checking out their website. First up we saw the chin spoiler. New Take Off is offering this for all 2005-2009 Mustang owners that are looking to add a stronger stance to their car. Designed by Classic Design Concepts, the spoiler highlights the natural lines of the factory bumper and features a textured black surface similar to the type seen on the stock black mirror housings. Though, these can be painted to match your existing body color. We liked it because it installs using factory hardware and a few strips of 3M acrylic bonding tape so you won’t have to hack up your bumper to install it. In this package, NTO includes the entire front bumper with the spoiler already installed! This is perfect for those with a beat up bumper that are looking to replace it with something with more style – and of course V6 owners wanting to upgrade to the GT look. New Take Off has this on sale for $369.99. Another sweet deal is the set of four chrome Mustang Bullitt wheels. Measuring in at 17”X8”, these five spoke wheels are the same ones equipped on the Bullitt Mustang with the chrome wheel option. That means they can fit all 2005-2010 Mustangs, including V6 models with no modifications. Normally these wheels sell for around $1,600. NTO on the other hand is letting these go for only $799.99, just under half what they normally go for. But the guys and gals over at New Take Off wanted to kick it up another notch for you Stang TV die-hards. They are offering an additional $100 of the Chrome Billett Wheels, when you purchase the wheel and tire package and use the discount code PowerTV. This deal runs until the end of the month, so move quickly! Knight Rider, as a television show, sucked. We’re not talking about the 80’s classic with David “The Hoff” Hasselhoff and Gary Colemen and the Trans Am-based K.I.T.T. That show is forever a classic, a tribute to 80’s machismo and science fiction. No, it was the new Knight Rider, with no-name talent and reject writers with no sense of suspense or action or coherent plots. It sucked, and NBC mercifully killed it after just one and a half seasons. And now you have a chance to own a piece of crappy show history. Mecum Auto Auctions is putting one of the K.I.T.T. 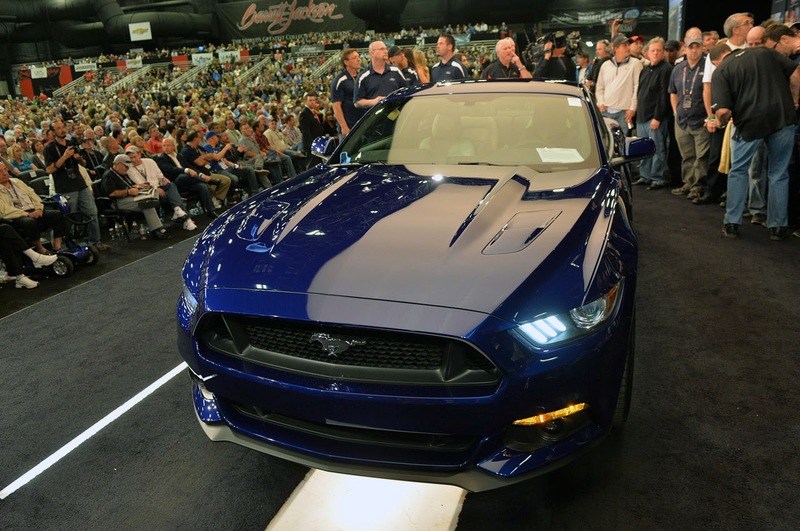 Mustangs up for auction, adorned with faux missiles and machine guns. There were numerous K.I.T.T.’s made for the television show, from the “Hero” car to the “Attack Mode” car pictured here. As the name suggest, the Attack car was the aggressive version of K.I.T.T., who had many weapons at his disposable including a laser, machine guns, and missles. K.I.T.T. also had many disguises, like an F-150, Transit Connect Van, and even a ’69 Mach 1 Mustang. Of course, this was all in the television series. The actual car is little more than a tricked out Mustang built by Harold Belker of Cinema Vehicle Services. It does have a side exhaust, much in the way in vehicle adornments, and an odd hood…scoop? We’re not exactly sure what that is on the hood, but this car does have the working Knight Rider light bar. This is one of just two “Attack Mode” cars built, with the other serving duty at Universal Studios in Hollywood. So here is your chance to own a piece of crappy television history! Finally, the BOSS Mustang is Coming! In that rarefied spectrum of Mustangs which we reverently call “Special Editions” are the most revered, the most significant and possibly the most expensive of all Mustangs in their time. Often, special edition models are used to drive sales when market forces are not cooperating. However, they can also be used to build showroom traffic, even if only the top few percent of customers could afford it. The 45-year history of the Mustang has seen many special editions. Some, such as the BOSS 302, are unforgettable, while others, such as the late 70’s MPG and Olympic editions, are eminently forgettable. Following the release of the S197 Mustang in 2004, a number of modern special editions followed. 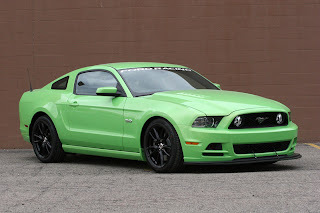 The 2008 Bullitt is likely the most memorable, while several regional special edition models are unlikely to appear in any but the most thorough history books. Speculation is fun and harmless, but ultimately unfulfilling. Past online discussions in enthusiast forums have long centered on the possibilities and the why’s and why-nots of a BOSS special edition. Trademark issues were raised as a possible deterrent, but the fact is that – usually – when Ford wants something badly enough, they find a way to get it. For example, in order to use the “MPG” mark in the mid-1970’s, Ford had to license its use from the Maine Potato Growers association. Recently, things have become more interesting. In time for the Daytona 24-hour race this year, Ford Racing introduced the BOSS 302 race car, designed to compete in the Grand Am GT-class of the Rolex series. That would apparently suggest that is there were any trademark issues with the BOSS name, they have been resolved. Far more encouraging are the following comments, attributed to Mark Fields, executive vice president, Ford Motor Company, and president, The Americas, at the recent Ford 2010 Dealer Show. At that point, a 1970 Boss 302 drove across the stage. A few years ago, Fields pre-announced the 2008 Mustang Bullitt at an industry event, well before it became available, so this revelation is not without precedent. Certainly, the return of the 5.0-liter engine presents an opportunity to create another collectible modern Mustang. A street legal car could not use the ‘Cammer’ 5.0-liter engine, as it was not designed for emissions compliance. Now, a new round of speculation can begin about the content and pricing of a new BOSS Mustang. At least, there is now a significant chance for fulfillment. Tools are an important part of the automotive lifestyle, and I think it is safe to say there is defiantly an unwritten list of “Must Have” tools. These can range from a simple box wrench, to a pneumatic-powered impact gun. With the advancement of technology, video, and more specifically, video cameras, have worked their way into the tool box of some of the top level racers regardless of sport. More and more, we see racers having their car recorded to study how it performs out on the track, just like in the stick and ball world. But why does the power and usefulness of video have to stop when the car gets off the track? We were checking out Cornwell Tools website and found this full color, high resolution, video scope designed for the automotive industry. Instantly, our minds were flooded with uses for this tool. We came up with a few of the places this would be useful to for our cars, but we also want to know – what could you use this tool for? Yeah, it happens to the best of us. You get a little excited with the RPMs, float the valves, and POW! Piston hits the valve, valve gets bent, and doesn’t seat right in the head. Now, while a simple compression check might be able to tell you which cylinder is the culprit, but could you really tell for sure that it was the valves and not a blown ring? Imagine if you could feed this camera into the spark plug hole and take a look at the valves, all without ever removing the heads! Sight is an important sense, no disputing that. We imagine that you could even use this camera to see things that you wouldn’t want your eyes exposed to, like inspecting the fuel pickup in your fuel cell without even draining the gas. Really, the uses are endless. This is one tool that is defiantly going to be on our wish list.